Servaris ProServ e500P is a highly reliable, low cost Pedestal Server optimized for Intranet and Internet services and applications in Small and Medium Offices based on the Intel C204 Chipset and features the power and performance of the Intel E3-1200V2 Quad-Core Xeon Processor. Combines performance with cost saving Enterprise SATA Hard Drives providing sustained uptime and large internal storage capability with Intel® Embedded Server RAID Technology supporting SATA RAID levels 0/1/10. With an Add-in SAS RAID Controller, the e500P Tower Server is equipped to handle 6GB/s SAS and/or SATA Hard Drives. In Small Business Environments where the need for a single reliable Server to host the companies Databases, eMail, Web Sites and, store documents, spreadsheets and other work, the ProServ e500P is ideal. The ProServ e500P Supports Microsoft Windows 2008 R2 and Windows 2012 Operating Systems. It's Open Source Operating System Ready and supports CentOS, FreeBSD, Fedora, Red Hat, SuSE, Ubuntu. Servaris e500P is an excellent cost-effective solution for Small Business Environments. ProServ e500P Pedestal Server Chassis with 365-Watt PFC Power Supply, Front Panel NIC, Status and Hard Drive LEDs. Hot-Pluggable Hard Drive cage for quick drive additions or replacements. 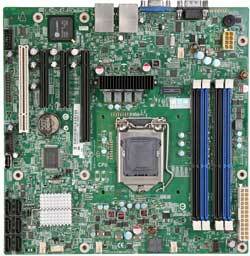 Processor Support: One Intel Xeon E3-1200V3 Series Quad-Core Processor up to 3.60 Ghz, 5 GT/s. Cooling System: Two fans positioned for cooling the main chassis and one for cooling the power supply; monitored by Intel Server Management. Power: 1 Fixed 365-Watt 80Plus Silver High Efficiency 120-240 Volt P.F.C. Power Supply.